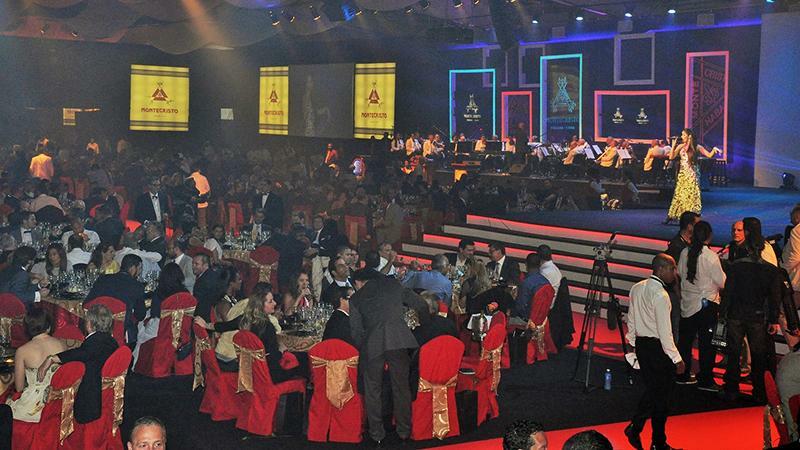 The 17th annual Festival del Habano closed with a gala celebration last Friday at the Pabexpo convention space in Havana. An auction of six custom humidors raised more than $740,000 in support of the Cuban public health system. The dinner was attended by more than 1,000 people. Naomi Campbell and Paris Hilton made a brief appearance as the evening's international celebrities. Throughout the evening, the attendees received handouts of the Montecristo brand, the largest selling Cuban cigar worldwide. Jorge Luís Fernández Maique, the commercial vice president of Habanos S.A., the Cuban cigar monopoly jointly owned by Imperial Tobacco PLC of the United Kingdom and the government of Cuba, reminded the crowd of the iconic status of Montecristo, even though it is the youngest of the six leading premium brands produced in Cuba. He said the brand had been started in 1935 by Alonso Menendez and gave a brief history of the first cigars produced by the company as well as some of the iconic sizes that have been introduced over the last 80 years. The evening was filled with performances by Cuban dancers and singers. Among the cigars handed out to the dinner's guests were the Montecristo Edmundo and the new 2014 release, the Montecristo Churchill Añejado. The evening's cigar gifts ended with a Montecristo 80th Aniversario, a 6 1/2 inch by 55 ring gauge cigar. In revealing the cigar for the first time, Habanos announced that it is a unique size in the Cuban cigar lineup, and that it also has a redesigned Montecristo band with a gold background. The auction is always the capstone of the Festival. Simon Chase, a well-known British cigar industry expert, led the auction. The first humidor recognized the H. Upmann brand and contained 400 cigars, including 25 Sir Winstons, a Churchill size cigar. It went for 85,000 euros ($95,148). The second humidor was dedicated to the Hoyo de Monterrey brand and was filled with 350 cigars; it was bought for 75,000 euros ($83,954). The third humidor auctioned off, a tribute to Romeo y Julieta containing 385 cigars, raised 70,000 euros ($78,350). The fourth humidor highlighted Partagás and had 380 cigars; it was bought for 85,000 euros ($95,148). The fifth humidor, which recognized the star of the night, Montecristo, had 425 cigars, including 50 of the new Montecristo 80th Aniversarios, which are scheduled to reach world markets this year. It sold for 97,500 euros ($109,116). The final auction lot of the night was a Cohiba humidor. The extravagant modern design had 560 cigars, including top of the line Cohibas: 75 Behikes, 25 Cohiba 1966 2011 Edición Limitadas (95 points in Cigar Aficionado magazine), and 25 Cohiba Robustos Supremos, a 2014 Edición Limitada, among others. The Cohiba lot produced a winning bid of 250,000 euros ($280,000). Three awards were given for Habanos Man of the Year. Gary Heathcott, an American freelance writer who has supported humanitarian aid to Cuba and other Latin nations, won in the communications category; George Fereos, who owns and operates the Casa del Habano in Cyprus, won in the business category; and Rogelio Ortuzar, a Cuban farmer who has been producing tobacco for more than 40 years, earned the nod in the production category.